If you're a skier or snowboarder, you know that weather conditions can change fairly abruptly on the mountain. From fog to sunny to overcast can all occur in the same day. Uvex thinks they have a pair of automatic tint goggles that can handle this issue. Different lighting conditions are often best served with different colored goggle lenses. Certain colored lenses help you see better in fog, while a different colored lens may be more appropriate for bright sunshine. Trying to carry multiple sets of goggles or lenses is just not practical. 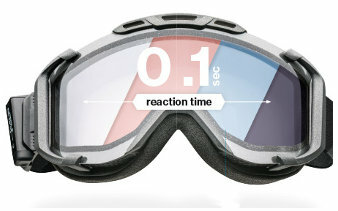 Uvex has the answer with their Snowstrike Variotronic goggles that automatically change the lens color as needed. The goggles are designed with a special LCD lens sandwiched between two clear lenses. The LCD lens can automatically (or manually) change from clear to red, blue or violet in 1/10th of a second. Not only can the LCD lens change color, but transparency as well. For automatic mode, the goggles include a special light sensor that monitors the lighting conditions on the slopes and instantly changes the lens tint as needed. If the skier or snowboarder wishes to have more control, there is a large button on the side of the goggles that allow the lens tint to be controlled manually, even when wearing gloves. The battery that powers the goggles should last up to 30 hours on a full charge. In addition, the lenses have an anti-fog coating and are also designed to block 100% of UVA, UVB and UVC rays up to 400 nm. We've seen goggles from other companies that include a Heads-Up Display (HUD) that can display weather, text messages and locations of buddies on the slopes (via bluetooth from a smartphone). Perhaps it won't be long until a pair of goggles that includes both sets of technology hits the market. The Snowstrike Variotronic goggles reportedly cost in the $500 range, but for a serious snowboarder or skier, the convenience and functionality may be worth the cost...just don't lose them.